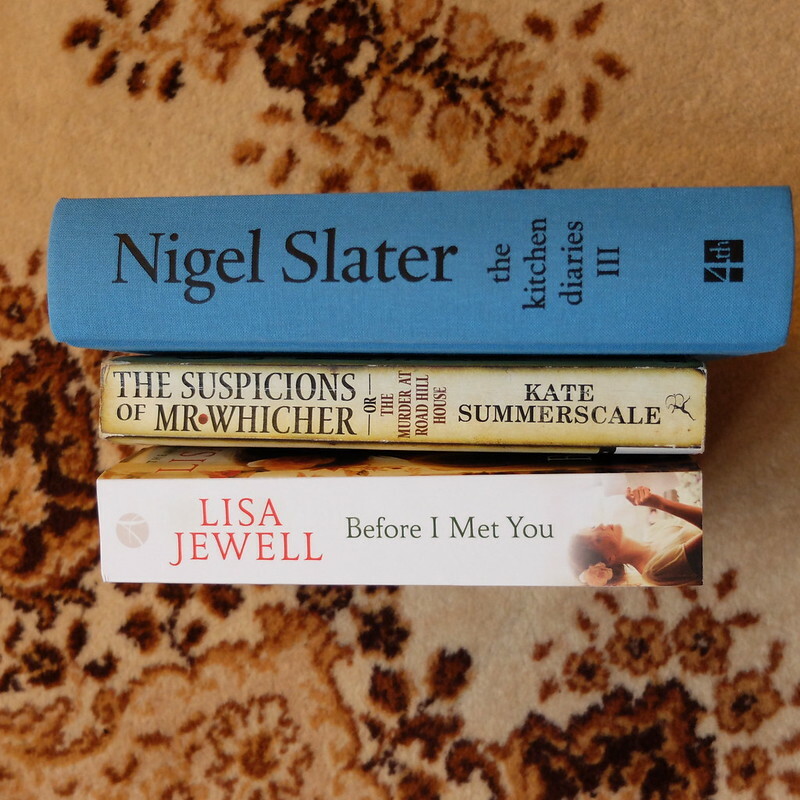 Welcome readers, new and old! I am just starting to re-connect with the outside world, from the little cocoon of my living room. It's been terribly wet here in Wales, and there have been days when I haven't ventured outside at all. The beauty of the internet however means that I have started catching up on reading blogs, and enjoying the festive snippets from your lives all around the world. I've also done a little internet shopping, thanks to some Christmas vouchers, so as I write this I'm testing out a What Katie Did waist cincher (definitely needed after the over-indulgence of eating cheesecake for breakfast over the last few weeks) and waiting for the post to arrive bringing some goodies from the House of Foxy, More on the purchases another time, as there is a lot to share (good and bad!). 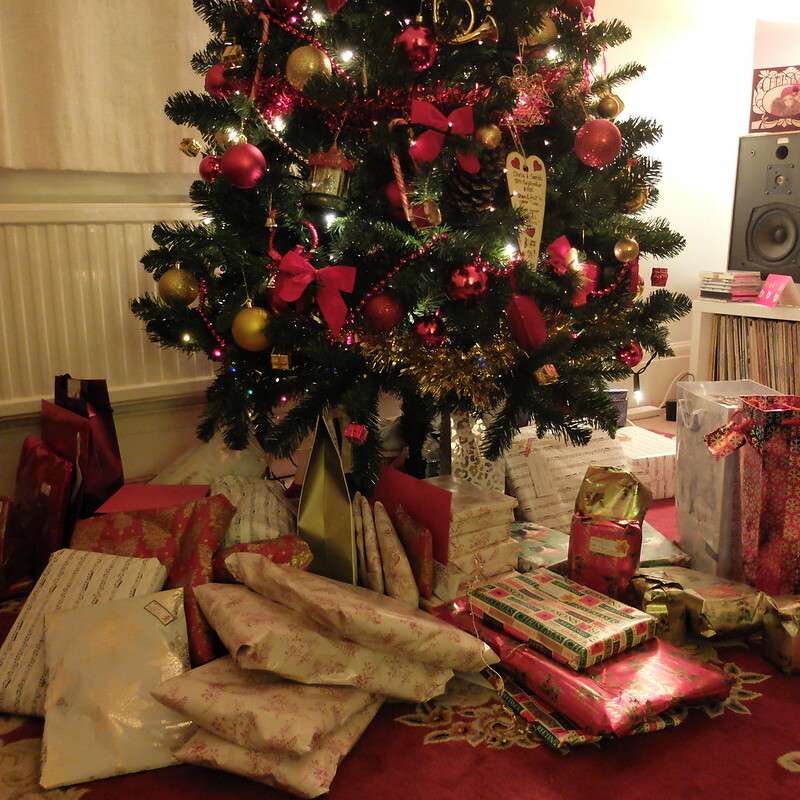 Christmas was lovely for me this year, a quiet one at home with my husband and his mother. We never buy particularly extravagant presents, no massive TVs, Ipads or XBox type gifts under the tree in this household, but we do tend to buy quite a few things, with there being a focus on the charity-shop challenge as to what you can buy each other for next to nothing. Our Christmas morning always starts with present opening with a cup of tea, a pause for a champagne breakfast, and then more present opening with more champagne. 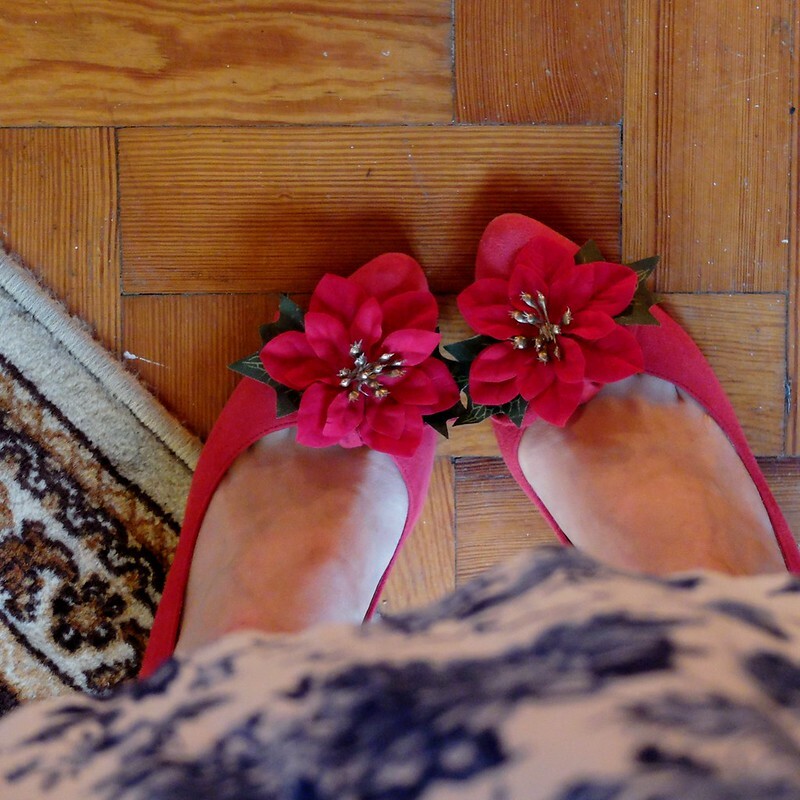 We dress up, and this year I wore my blue and white Whispering Ivy dress with red shoes, a red shrug, and those fabulous new poinsettia shoe clips. I'm afraid I don't have any full length shots as I was too busy drinking champagne. 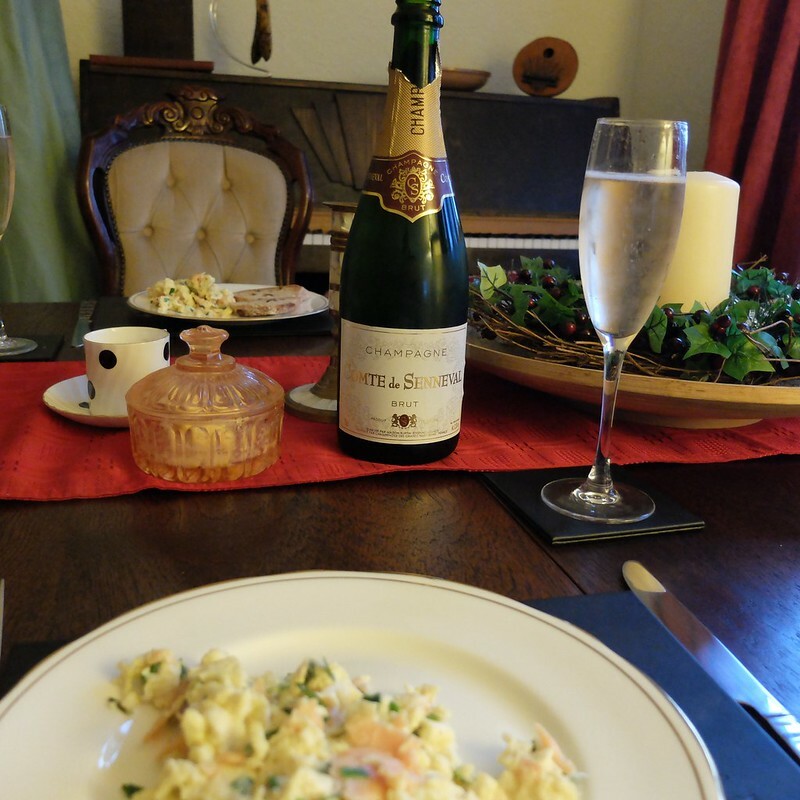 In our new household, this being only the third Christmas that my husband and I have had in our own home, we have a few newly established traditions. As I've already mentioned, it's champagne for breakfast. 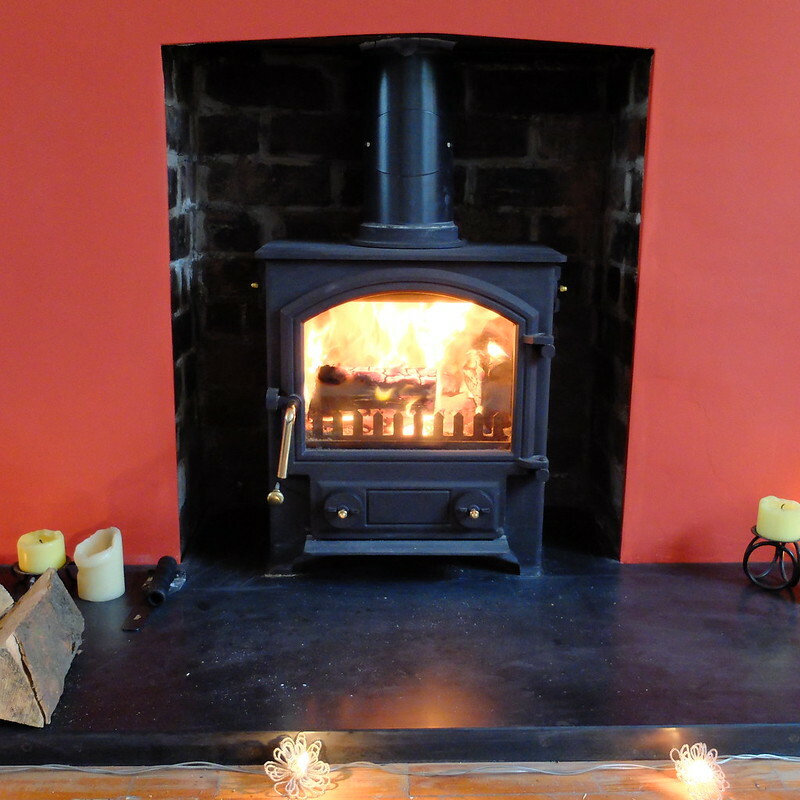 The next tradition is burning a yule log in our stove. The idea is to sprinkle it with salt and wine, say a few thankful words about the year that's passed, and wish for health and happiness in the coming year. It's a nice thing to do, and something that is more in keeping with a celebration of the winter season than Christmas itself, which sits better with me as I'm not someone who celebrates the religious aspect of the festive season. 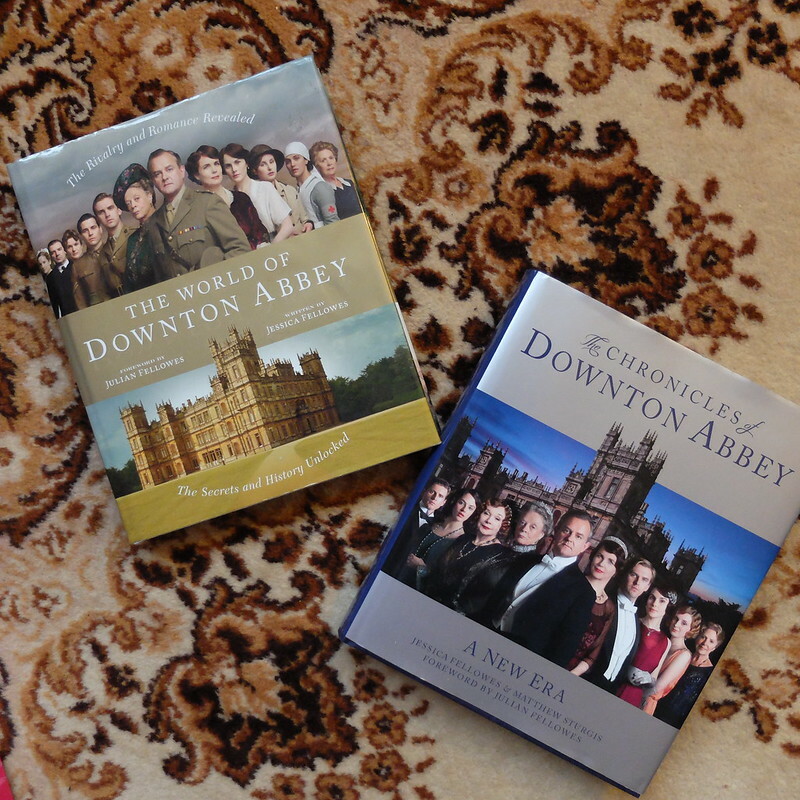 I was spoilt with lots of books this year, including some Downton Abbey companion guides (very fitting after my trip to Highclere and to the Downton costume exhibition), and an antique copy of 'Melbourne House' by Susan Warner from 1897. 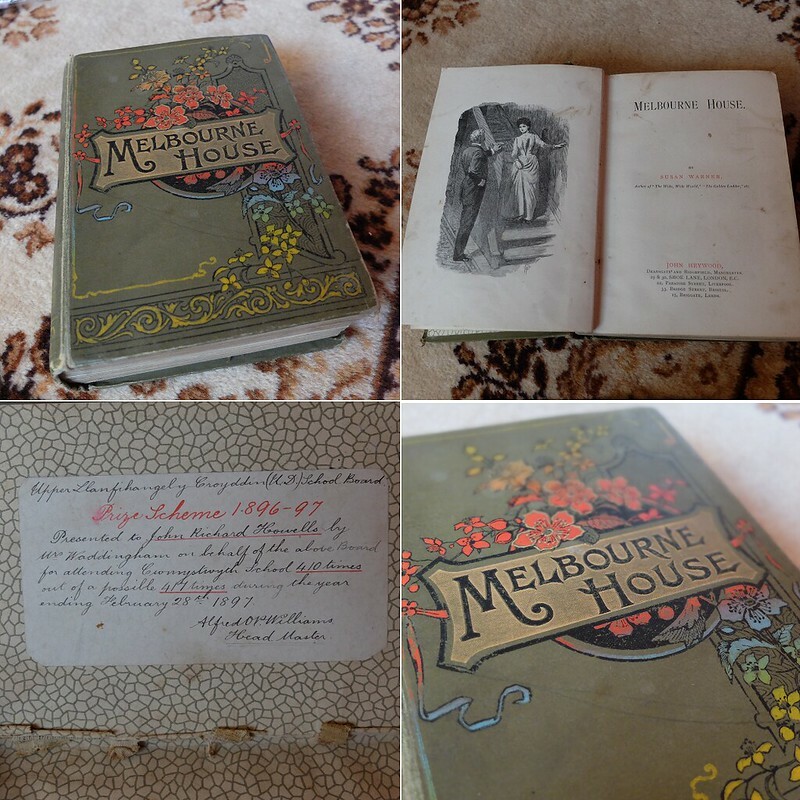 It's amazing to think the book is 118 years old, it's actually in fair condition. 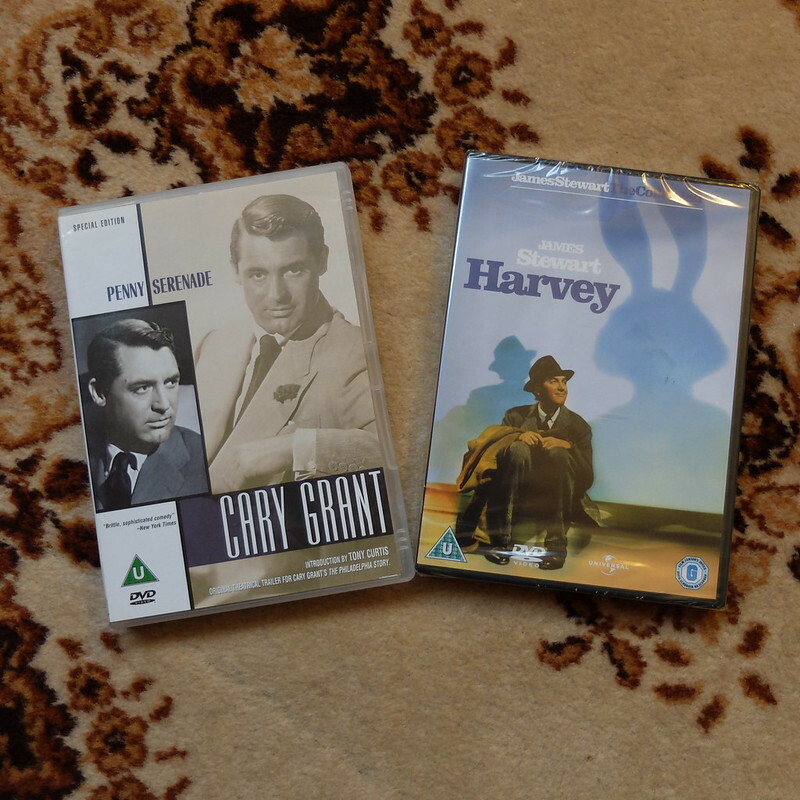 I also had a couple of old films on DVD, Penny Serenade and Harvey, and the third series on DVD of Miss Fisher's Murder Mysteries. 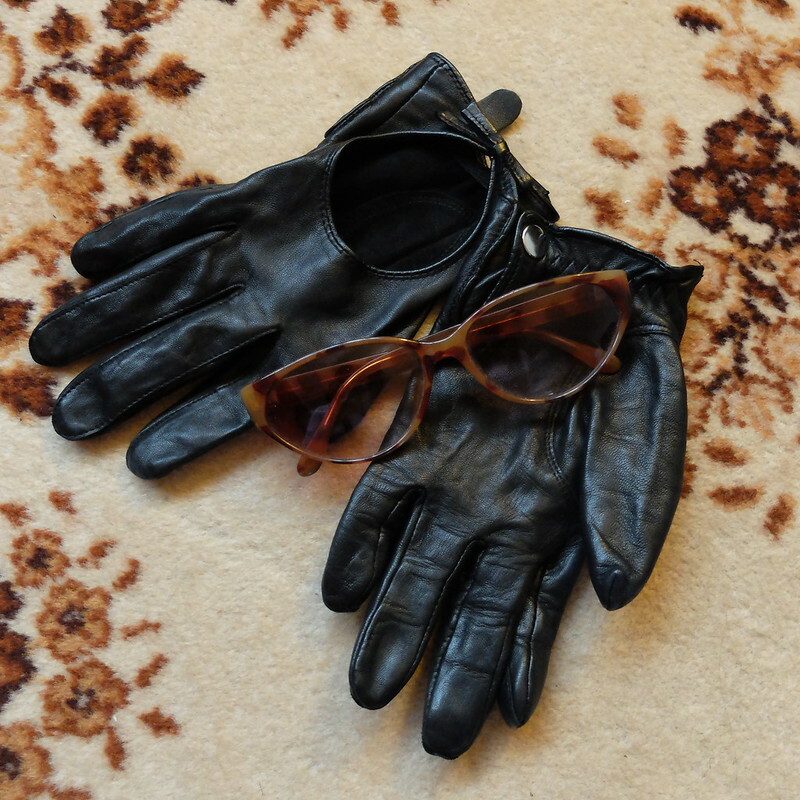 In terms of things to wear, I had a pair of black leather driving gloves, and an original vintage pair of cat eye sunglasses. Well, the Christmas pinup duvet has come off the bed now and it's starting to feel like the end of the party. Today is New Year's Eve, but we don't have any grand plans. My ideal New Year would be spent at a 1930's style house party, perhaps on an island like in the recent Agatha Christie TV adaptation of 'And Then There Were None' (which I really enjoyed, did you see it?). Only with no murder and better weather obviously. Wishing all of you a wonderful New Year, whether you'll be sat at home in your pyjamas, or at some glamorous red carpet event! How fantastic that you guys already have some established Christmas traditions of your own. That's beautiful and will only serve to make each season richer and more enjoyable for you both. Thank you for the lovely look at some of the ways you've been celebrating lately. With all my heart, sweet Porcelina, I wish you and your husband both a fun filled, happy and very lovely New Year! Sounds like such a lovely Christmas especially with your Christmas traditions of a champagne breakfast and sprinkling salt and wine on the yule log to toast the new year. I hope you have a fabulous new year. Happy New Years! I'm glad you had a great Christmas this year and have established some traditions of your own. The Christmas Agatha Christie was incredible, totally didn't see the ending coming at all. Happy new year!! What a nice Christmas you have had! I love your traditions, I think the Charity shop challenge is an awesome idea! 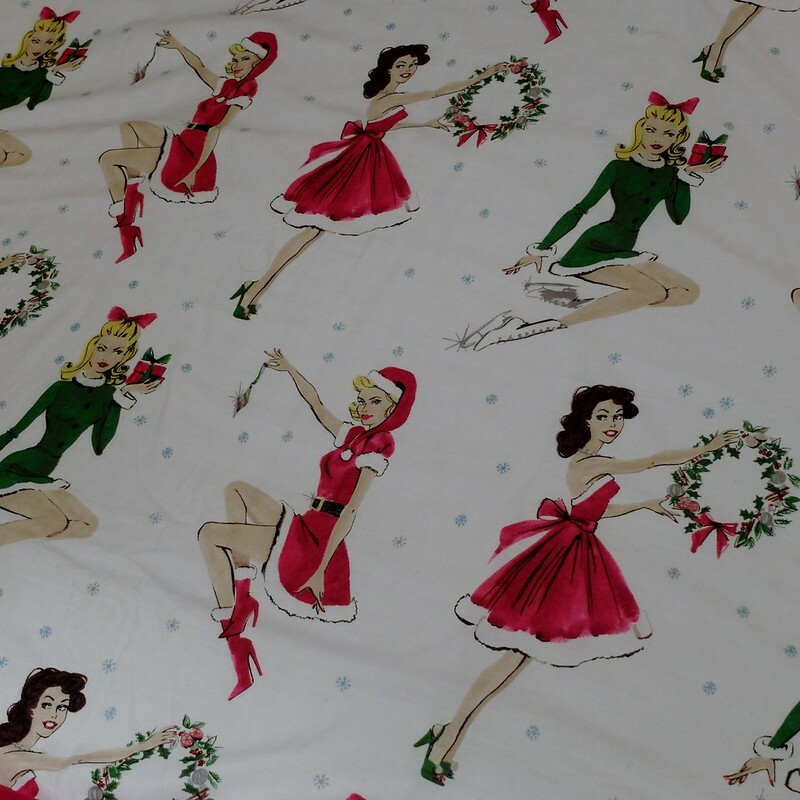 I also have to comment on how amazing that Christmas duvet is. I look forward to seeing more of your posts in 2016! So nice presents! I just found your blog and am very excited to see what's up in 2016! Happy new year! Ooh, that Melbourne House book is a beauty - let us know how it reads. Rode, where the murder in Mr Whicher took place, is a couple of miles from where I live, and my town's museum had a small exhibition connected with the book last time I was there. It's a really tragic, fascinating case. Your house looks beautiful in the little glimpses you give us.